This is a brief introductory website for the Llanarmon village church and parish, which is in the Clwydian Hills in northeast Wales, midway between Mold and Ruthin. The church is a very ancient foundation. By the 9th century St Garmon was identified with St Germanus of Auxerre who visited Britain in 429 AD. Part of what is believed to be the shrine of St. Garmon, a memorial to Gruffydd ap Llywelyn ap Ynyr 1320, and to Sir Evan Lloyd 1586, with rare Welsh inscriptions are in the south aisle. There is also a fine medieval candelabra and parish chest. The church is one of thirteen together forming the Dyffryn Clwyd Mission Area , which is itself in the anglican Diocese of St Asaph. Find information about the village and in particular the Old Schoolroom, which is adjacent to the church, and which has been fully renovated and made available for bookings for a wide variety of functions. 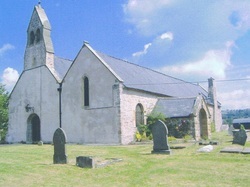 The church is in the centre of the village of Llanrmon-yn-Ial. From the A494, about mid-way between Mold and Ruthin, turn south along the clearly signed B5430/B5431 and continue for about two miles. Turn right at a staggered crossroads and follow the road to the village. The church is on the left hand side, opposite the Raven inn. If you find a mistake on this site, or a broken link, or have any questions, or suggestions for additions or improvements, please click here to send them to the webmaster.